In this Adobe Illustrator Video tutorial I’ll cover a bunch of tools that are often neglected. 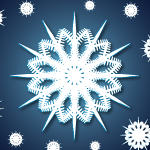 In the end you’ll be able to create this snowflake and do a bunch of cool things with text. Here is the file I created if you want it Illustrator Snowflake. Do what ever you want with it. And a bunch of other Illustrator tricks along the way! If you have any questions or comments, leave them below. In the future I’m going to devote a few weeks to just Adobe Illustrator and PhotoShop because of the demand. So watch for that! Thank you for the wonderful Illustrator CS5 Tutorials! These are some of the best I have found anywhere online! Please keep up the great work. When you drag the rectangel tool, what are you do to get the point fromt he rectangel? Are you using the keyboard? i think what Karen had asked is the Rotating tool. and yes, it is the R key. IMHO.